If you like to make formal canapés, you’ll find many German products ideal for shaping into dainty bite-sized finger food. 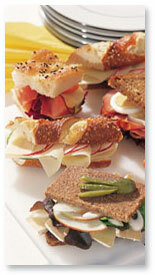 Thinly sliced cold meats are easy to fold or roll; cheeses can be cut into neat squares or rounds; Vollkorn, rye and Pumpernickel breads can be stamped into shapes using small pastry cutters; Quark is ideal for flavoring and piping into swirls, while pickles and relishes are idea as toppings and garnishes. It’s all so easy! Remember to keep the canapés (called Häppchen in German) bite-sized so that each canapé can be popped into the mouth quickly. Garnishes should be subtle. Canapé ideas courtesy of Roz Denny, Modern German Cooking.